Construction of a long-awaited improvement project near Lake Tippecanoe begins next week thanks to generous funds granted by Lake Tippecanoe Property Owners Association to TWF. Construction of a long-awaited improvement project near Lake Tippecanoe begins next week thanks to generous funds granted by Lake Tippecanoe Property Owners Association to The Watershed Foundation. Twenty-seven years ago the landowner installed 9,275 feet of grassed waterways on his property, but through time these waterways have degraded – reducing their effectiveness. Next week, the land, identified as a source of sediment and nutrient pollution in our watershed will undergo repairs on 1,302 feet. Grassed waterways are constructed graded channels that are seeded to grass or other suitable vegetation. The vegetation slows water and the grassed waterway conveys the water to a stable outlet at a non-erosive velocity. 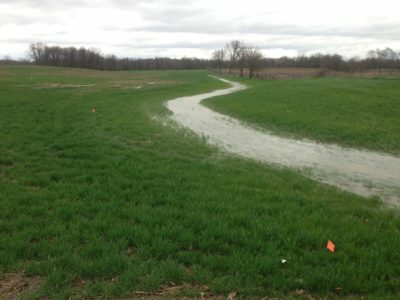 Grassed waterways are used where gully erosion is a problem – like between hills and other low-lying areas on slopes where water concentrates as it runs off a field. 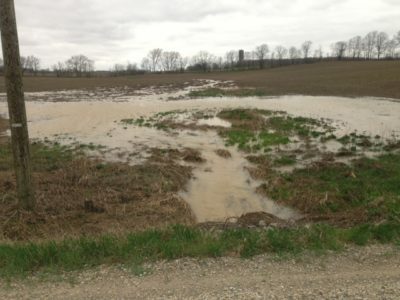 Reducing this erosion helps keep valuable topsoil on the farm and prevents it from entering lakes and streams where it could potentially grow algae and weeds and fill in channels and lake basins. This one project will prevent nearly 5 Million pounds of weeds and algae per year! The same landowner will also be utilizing two years of no‐till & cover crops on 118 acres. A cover crop is a plant that is used primarily to slow erosion, reduce the need for chemical herbicides & fertilizers, improve soil health, infiltrate water, increase biodiversity and bring a host of other benefits to the production, as well as local waterways. This project will prevent another 4.8 Million pounds of weeds & algae per year! These projects are typical examples of win-win solutions TWF implements with partners – taking action to solve serious problems facing Lake Tippecanoe, and the 60+ lakes in the Tippecanoe River watershed. No other local nonprofit organization is implementing these on-the-ground solutions to water pollution. Our volunteers, partner organizations (e.g. Lake Tippecanoe Property Owners Association, Kosciusko County NRCS and SWCD) and generous supporters like you make these impactful results possible.